Some people never learn, and thank God for that. If failure were an actual deterrent we would have never made it to the moon and back or accomplished any of the most of amazing feats of mankind. That spirit doesn’t always have a victorious outcome, and thanks God for that too. Because if it did, Hollywood wouldn’t keep shooting themselves in their collective foot and doing damage to the liberal agenda they continue to push. Variety reports “Hollywood is gearing up for midterms,” meaning those spoiled millionaires with more time on their hands than anything resembling understanding of what real life is like for the vast majority of people at which they look down their noses will be back to attempt to impose their will on flyover country once again. These elitists – people who haven’t heard the word “no” from anyone with the power to back it up and haven’t been anywhere they couldn’t afford something since their teen years – are poised tell Americans what is best for them. For decades, people who work in make believe a few months a year for more money than the average American will earn in their lifetime have been trying to convince people they know, and care about, what’s best for them. It always rings hallow because, with rare exception, people who has no need to ask the price of anything simply has no clue what someone who has to be acutely aware of the cost of everything thinks about life. When a Spielberg or DiCaprio sees something they want, they buy it. When a factory worker does, they save for it or accept they can’t afford it. Those two worlds are universes apart. That is why these pushes from liberal Hollywood fail. It’s also why they always try, and why that’s a good thing for Republicans. Yes, they will try, and they will spend a lot of money trying. But the chasm between what someone who needs to shower before they go to work and someone who needs to shower because of a day of hard work has never been greater. The person who vacations on a party yacht filled with Victoria’s Secret models has no clue what matters to people who goes camping with friends. While the world would be a happier place if there were more party yachts and Victoria’s Secret models, most people just want to be left alone to live their lives. That’s where Hollywood loses the public. They think they’re selling people freedom in the form of government largess. But people know it’s slavery with a velvet cover. The one thing the progressive left doesn’t understand about most Americans is they don’t live in a constant state of jealousy and envy of people who have more than they do. They aren’t looking to empower the government to take from someone with more to give things to them. Even if they’d like to have a party yacht filled with Victoria’s Secret models, they’d rather earn it themselves. More importantly, whatever their lives may be, they hope their children earn a better one and are willing to work hard and sacrifice to help them achieve it. The promise of a shortcut doesn’t hold water. Most people just want to be left the Hell alone. Hollywood has tried, with some success, to instill jealousy as a value. Reality shows highlight the vapid and idle as if they are something to aspire to be, and the weak have bought into the idea that getting attention is more important than why that attention is gotten. People with pride, however, have not. And there are more of us who’d rather earn our way through life than have it stolen for us by our rulers. We rule ourselves. That’s ultimately why all these bi-annual pushes by Hollywood have failed. They may be able to tell a good story every once in a while, or make us laugh, but their desire to manipulate us doesn’t work because they don’t understand us. They can’t. You can’t really understand ideals and people you hold in contempt. And after all those years of failure and all that money wasted, their collective contempt for the only people who’ve told them “no” and made it stick has grown to the point that it taints everything they do. 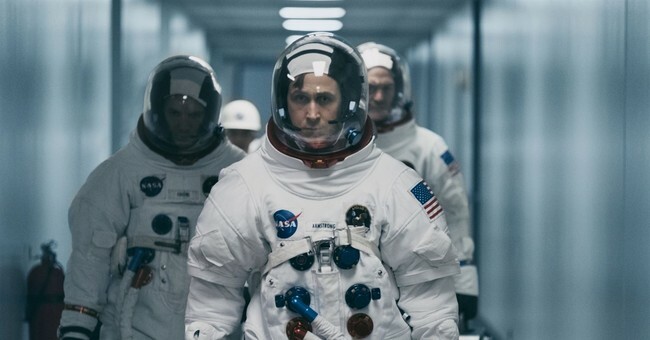 That’s how they can make a movie about the first moon landing and leave out the planting of the American flag. It’s how they can keep making movies about how awful they think the country is and have them not find audiences. It’s how they could abuse their positions and leave a path of sexual assault in their wake and think nothing of it until it was exposed. And it’s how they and the fellow leftists will ultimately lose. So I welcome Hollywood’s recommitment to fighting for the values people who earn the dirt under their fingernails reject. Hard-working Americans aren’t about to be convinced to vote for liberalism by a 5 minutes Will Ferrell video or a star-studded YouTube lecture on the importance of some progressive fever-dream. But they will inspire some leftists to the polls, which is where the real fight in November lies. PS: If you like my columns you’ll love my book, “Outrage, INC: How the Liberal Mob Ruined Science, Journalism, and Hollywood.” It explains the why and how of what the left does in order to keep people feeling (usually anger and fear) to prevent them from thinking and acting rationally, and it does so with a lot of humor. Don’t take my word for it, take the words ofMark Levin,Ann Coulter,David Limbaugh,Dana Loesch,Dan Bongino,Michelle Malkin,Ben Shapiro,Kurt Schlichter, and countless others. Obviously, I have an interest in selling you a copy of the book, but they don’t. Yet they’ve all endorsed it. And, for reasons I don’t understand but am eternally grateful for, people are still buying it. You will love it, learn from it, and laugh throughout it, trust me. Thanks!